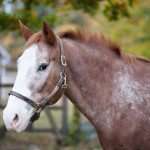 Description: Born April 19, 1998, Sparky, aka “Spartacus”, is an Appaloosa gelding who came to Troop in March 2011. He is also affectionately known as “Fatty”, because he does love his food! Personality: Sparky is always looking for a good time. He is funny, playful and loves making new friends (he currently is “besties” with Bill). He is appropriately named “Spartacus” because, while mostly willing and good under tack, he sometimes likes to stage a revolt against his master! History: Sparky came to NCMT in March 2011 . His favorite occupations are: turn out time, making sure the barn is properly run and acting awesome and majestic….